With the recent announcement of fourth DLC, Black Ops 3 Salvation brings forth the finale of the Origins Zombies storyline. In addition to Zombies, Salvation brings four action-packed multiplayer maps to the table. Revelations, featured in Salvation, is the the long-awaited final chapter in the Origins Zombies saga. In Revelations, we meet up with the Origins characters after they’ve taken an epic journey through space and time – all of their struggles lead to this very moment. In this, the final chapter of the Zombies experience, Richtofen, Dempsey, Takeo and Nikolai finally come face to face with the mysterious Doctor Monty in The House. Confronted by an ancient evil, our heroes must fight the zombie horde once more in the final battle to save their immortal souls. 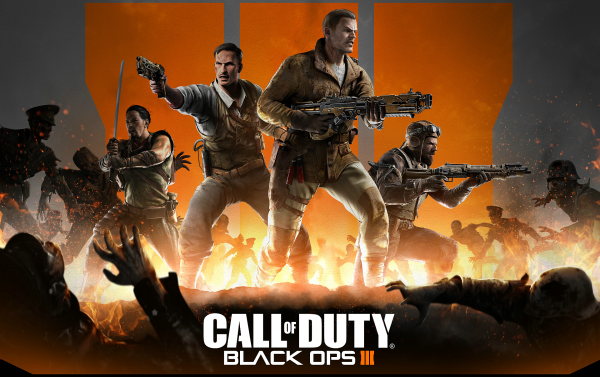 Call of Duty: Black Ops III Salvation is also loaded with four new action-packed multiplayer maps that jettison players from the ancient walls of a medieval fortress to the deceptively quaint setting of a backyard picnic. Citadel: Once home to a powerful medieval army, this ancient castle now sits broken and abandoned. Tight corners force close-quarters engagements, while the moat and drawbridge allows for unique player movement opportunities in this mid-sized map. The last trespassers didn’t make it out alive – maybe you’ll have a better shot. Micro : What’s better than a BBQ on a hot summer day? A miniaturised war zone that takes place on a well-stocked family picnic table, that’s what! Navigate this bite-size battlefield for a larger-than-life experience. Outlaw: Gear up for a showdown in Outlaw; a western-style re-imagining of the fan favourite map Standoff from Call of Duty®: Black Ops II. This rough-and-tough medium-sized map brings classic engagements, flanking routes and strategic positions for long and medium ranged combat. Rupture: The Call of Duty®: World at War classic Outskirts is re-imagined as a high-tech facility, designed by a futuristic society desperate to repair the Earth’s atmosphere. From the sound of it, it looks like to be the end of Treyarch’s Zombies storyline, which I’ve enjoyed considerable since I first started playing with Black Ops 1. Since then, I picked up World at War to get a feel of it to compare the original releases to what was available as the remake for BO1, and still really liked it. Who knew that an Easter Egg in World at War would wind up to be so popular? I’m anticipating that the ending will be an absolute blast, but I hope that this won’t be it for Treyarch’s rendition of Zombies. For the multiplayer maps, Citadel sounds to be quite an exciting close-quarters-combat map that could possibly turn into a fan favorite, while Micro sounds pretty gimmicky. Taking a cue from Black Ops 2 Apocalypse DLC, the last two maps are re-releases from two previous games. With Standoff reappearing as Outlaw, it should be an interesting take on the map and I bet it’ll probably be about as popular as when Firing Range was remade for Black Ops 2. Finally, with Outskirts from World at War being re-released as Rupture, this map will probably prove to be popular as well. The trailer looks absolutely amazing as well!Call of Duty: Black Ops III Salvation is currently available for preorder for the PlayStation 4, and releases on September 6th. Salvation PC and Xbox One will be available approximately one month afterwards, due to release scheduling.